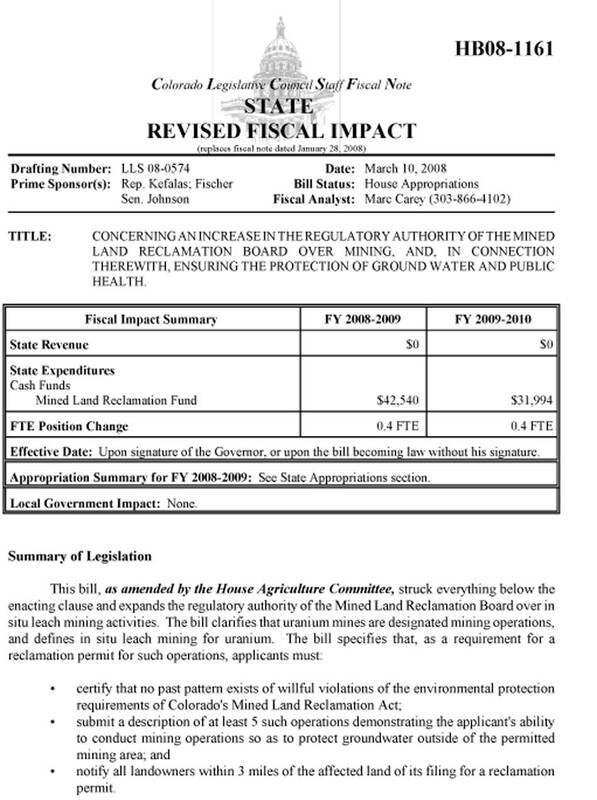 Colorado Legislative Council staff released the "State Revised Fiscal Impact" report on House Bill 1161 today, which would for the first time in state history develop rules specifically for in situ leach uranium mining. The bill's primary sponsors are Democrats John Kefalas and Randy Fischer, and Republican Steve Johnson, all of Fort Collins. The northeast edge of Fort Collins is about 7 miles from the nearest uranium ore deposit slated for mining by Powertech Uranium Corp.
HB-1161 would require ISL mine operators to restore ground water aquifers to premining levels or better for all contaminants. However, if baseline levels are lower than state human health standards, the operator would only be required to clean up the water to such standards. 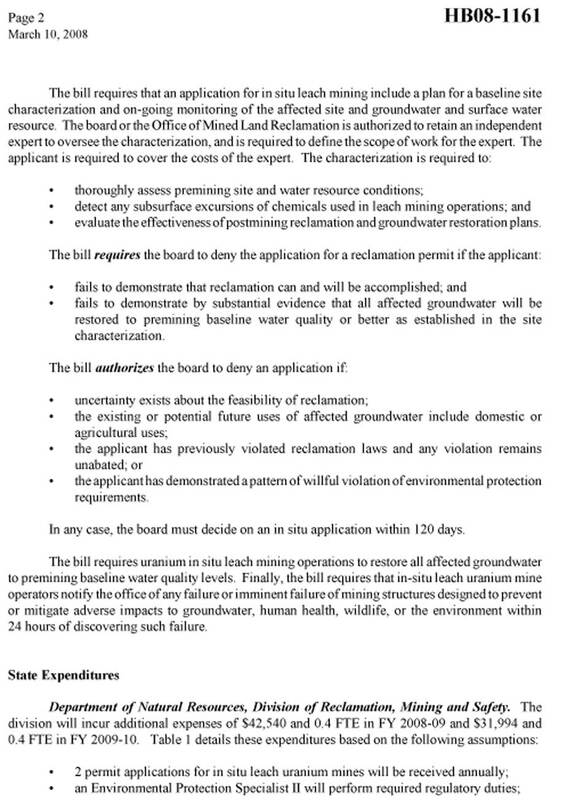 Permit applicants would be required to present sufficient evidence that such restoration is possible and has been successfully accomplished at other ISL mine facilities. The bill was recently approved by the House Agriculture Committee on an 11-2 vote. It was referred to the House Appropriations Committee where representatives will consider the fiscal impact of the bill. The fiscal impact report assumes that two ISL permit applications per year will be processed during the next two years. It anticipates that attorneys from the Colorado Department of Law will develop rules at a cost of about $9,000. After rulemaking, state attorneys will be needed on an ongoing basis at a cost of about $6,000 a year. 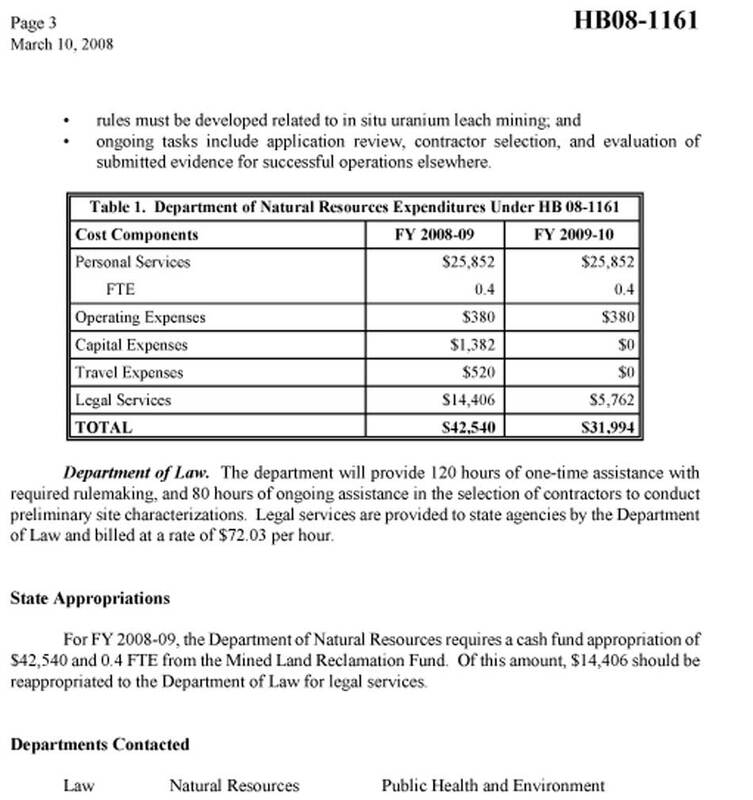 These public funds would simply be transferred from the state Department of Natural Resources to the Department of Law. Additional costs paid by the Department of Natural Resources to implement the bill would be less than $30,000 a year.